Letchworth, August 21st 2017 – Fleet Source, a leading provider of unrivalled training for the road transport industry, has been chosen by A-Plant to be their main provider for driver CPC training. A-Plant required a training provider that could deliver leading edge driver training courses, that cut to the heart of the issue and whose content was engaging, interactive and dynamic, to be able to keep the drivers attention throughout the courses. Another key requirement was that the course instructors needed to have extensive transport experience, in order to build trust and confidence with the drivers, ensuring the training was as effective as possible. Due to the scale of A-Plant’s business, they also needed a training provider that could deliver the training on a national scale. •	Helpful, friendly and professional staff who go above and beyond to make driver training painless for them with the amount of complexities involved. •	The ability to hold and deliver training sessions at A-Plant’s locations across the country, ensuring minimal downtime for drivers and reduced travel costs. •	They ensure all logistical planning is taken care of, including the set-up of the training room and location, a trainer for the course and all equipment necessary (such as bikes, safety equipment etc). •	Their vast range of courses they can deliver to meet their requirements beyond what other training providers can deliver. •	Flexible to their needs – the ability to book training when required, for varied numbers of drivers at different depots with a fast turnaround. “I would highly recommend Fleet Source’s training - they have a varied and diverse range of courses, are reliable, always provide a proficient level or service throughout the entire process and are flexible to meet our needs. 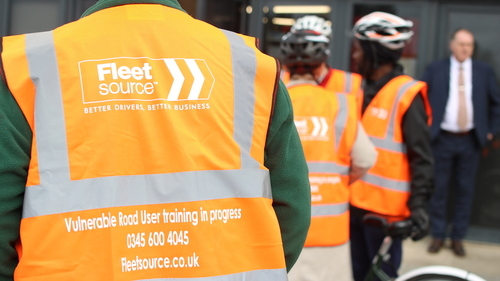 Plus being the largest provider of Vulnerable Road User training (Safe Urban Driving) in the UK, I had no doubt that they could meet our specific challenges” Rebecca concluded. Fleet Source is now one of the top ten DCPC providers in the UK (based JAUPT data of volume of courses uploaded in 2016) and delivers an extensive range of DCPC courses to various industry categories. The company has built an enviable reputation on the quality of its courses, its training delivery and course development expertise and delivers whole fleet training to some the UK’s largest fleet operators, particularly in the construction sector. Fleet Source is also Transport for London’s primary contractor for the delivery of their funded driver training programs and is now the largest training provider of Approved Vulnerable Road User (“VRU“) training in the UK, with over 30 dedicated VRU training sites throughout the UK. Fleet Source is also part of the FORS (Fleet Operators Recognition Scheme) Community Partnership and is the accreditation body for the FORS scheme delivering over 4000 FORS Audits per annum . As such, Fleet Source has unrivalled understanding of FORS and CLOCS and the requirements of operators in meeting the required best practice standards. A-Plant is proud to be accredited with ISO 9001:2008, ISO 14001:2004 and OHSAS 18001:2007, confirming that we have one of the most robust safety and quality management systems in the industry. Our fleet of equipment available to hire comprises over 200,000 itemised pieces of plant, tools and equipment. We invest a multi-million-pound figure each year in new equipment and state-of-the-art technology, to ensure A-Plant customers can hire the very latest equipment from world-class manufacturers such as JCB, Hilti and JLG. We have a workforce totalling more than 3,600 employees, based at locations nationwide, including a support office in Warrington, Cheshire. At A-Plant, we can offer a truly national service, regardless of how specialised or remote a customer’s needs may be. A-Plant forms part of FTSE 100 company Ashtead Group PLC, which also comprises Sunbelt Rentals based in the USA. Ashtead Group PLC has become firmly established as one of the world’s leading equipment outsourcers. This press release was distributed by ResponseSource Press Release Wire on behalf of The PR Room in the following categories: Manufacturing, Engineering & Energy, Transport & Logistics, Construction & Property, for more information visit https://pressreleasewire.responsesource.com/about.